Quilting Adventures: It's been a long time coming ....! I must say that I do like the way it turned out. It sort of makes up for all the pattern problems I had. 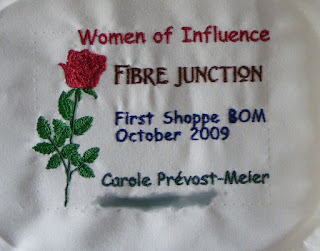 Ta dah... my Women of Influence BOM Quilt.....! It's done and hanging in the Shoppe! I couldn't get a full picture of the quilt, as it's quite large (92 x 116)! It's machine pieced and machine appliquéd. The pattern is now available from the book Women of Influence 12 Leaders of the Suffrage Movement by Sarah Maxwell and Dolores Smith. You can read more about this BOM it in a prior post here. 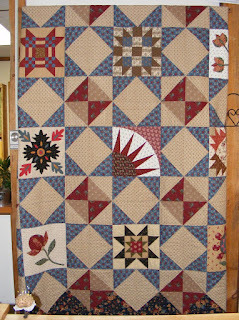 I used this project to push my machine quilting comfort zone. I don't know if you can see some of the details, but I have some echoing going on in 2 (two) of the machine appliquéd blocks and lots of "in the ditch work" AKA ruler work etc. I've even machine embroidered a label for it! Thank you for visiting my little corner in cyberspace. Carole! It's beautiful! I love the colors. Congratulations on a great first finish for 2010! It really did turn out beautifully. I am so glad than you and Penelope are getting so comfortable with each other. That is such a nice quilt! I want to make one this year. The quilt looks great...beautiful work.